Urethane Gaskets – Tight Tolerance Urethane Gaskets! Urethane Gaskets ? You’ve come to the right source! Industrial Urethane Gaskets: Industrial urethane gaskets are custom made at Plan Tech for any profile or application needed. Plan Tech will frequently decide to utilize our in-house water jet cutting capabilities and cut any profile from a urethane sheet to produce industrial urethane gaskets configurations. Urethane O-Rings: Urethane O-Rings are a great solution when traditional o-rings fail or are not available in the size for your custom application. Urethane o-rings are typically molded to size using compression molding. This will yield parts to print with no secondary process saving you money! 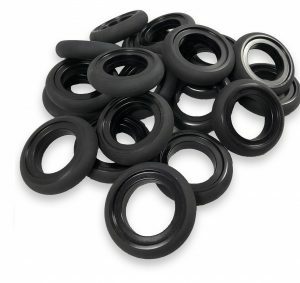 Urethane o-rings are available in all durometers and sizes. Urethane Spacers: Urethane spacers are commonly found in hardware stores in nominal sizes, Plan Tech specializes in high volume urethane spacers of any size for any high abuse applications. Custom sizes and shapes are no problem for Plan Tech’s in-house mold making fabrication and machine shop. Wastewater Treatment Plant Urethane Gaskets: Our highly skilled team of engineers are capable of turning formulations that transmit vibration to urethane gaskets that meet your specification. We boast a state of the art machine shop that is fully equipped with machinery which allows us to manufacture high volume urethane gaskets at a reasonably economical rate. No other brand in the industry offers wastewater treatment plant urethane gaskets at a more affordable rate than us, with our products, you can be sure of reduced operating costs. Waterjet Cut Polyurethane Gaskets: Our waterjet cut polyurethane gaskets offer the type of performance ability and service life that is second to none in the industry. They provide remarkable resistance to wear, chemicals and abrasion. And their ability to maintain their performance ability in harsh environments where the waterjet cut urethane gaskets of other brands fail, is just fantastic. Tight Tolerance Urethane Gaskets: Our tight tolerance urethane gaskets which boast remarkable physical properties offer superior load bearing capability as well as outstanding ability to resist wear, chemicals, abrasion, and corrosion. They are also renowned for their impressive capacity to withstand harsh environmental conditions which enable to maintain their optimal performance even after years of being repeatedly used. Custom Polyurethane Gaskets: No matter the profile or specification of custom polyurethane gaskets you seek, you can rest assured of finding it at our company. And our highly skilled team of engineers are capable of turning your CAD, sketch, drawing or idea of custom polyurethane gaskets into a first-class polyurethane part. Polyurethane Rubber Gaskets: Polyurethane rubber gaskets are commonly used in applications which experience high temperatures. Polyurethane is resistant to cuts, intense heat, and high pressure. Also, polyurethane as a material can withstand oil and many other types of chemicals. So even if there is any spillage, the flexible polyurethane rubber gaskets will continue to work. Manufactured at our fully equipped manufacturing facility in the USA our polyurethane rubber gaskets are about the best you will find in the industry. Precision Cut Urethane Gaskets: Plan Tech has over 30 years of specializing in the manufacturing of precision cut urethane gaskets for a wide range of industries and applications. We utilize the tough characteristic nature of urethane which outperforms plastic, rubber, and steel in its capacity to resist harsh environmental factors such as abrasion, heat, oil, solvent, acid and many chemicals. Polyurethane Gasket Manufacturers: As one of the pioneers in the industry today, we know what it takes to be one of the best polyurethane gasket manufacturers. We offer precision cutting and guarantee high-performance polyurethane gaskets at competitive pricing. 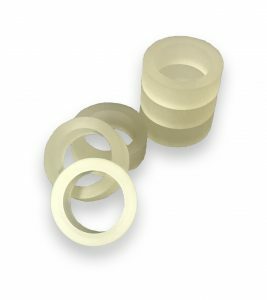 Being one of the leaders amongst other polyurethane gasket manufacturers, our company’s reputation for excellence has been built on our ability to provide polyurethane gaskets with excellent abrasion, chemical, and corrosion resistance. Wear-Resistant Urethane Gaskets: Wear-Resistant Urethane Gaskets can also be custom-designed to different patterns, thicknesses, and materials; they are manufactured depending on its application. Hence the wear resistant urethane gaskets are created to significantly reduce equipment downtime and maintenance costs. Plan Tech fabricates die cut urethane gaskets and we also water jet cut gaskets in a wide variety of thicknesses, colors and durometers. The Shore A durometers range from 60 to 90 providing a wide range. Polyurethane is a very versatile material that provides the elasticity of rubber paired with the durability and strength of metal. Urethane commonly outperforms plastic, rubber and steel due to it’s ability to resist harsh environmental factors such as abrasion, heat, oil, acid, solvents and many chemicals. Plan Tech’s gaskets perform extremely well for hardness, tensile, tear and compression strength as well as impact resistance. Urethane also performs well in temperatures ranging from -50°F to +180°F. Plan Tech fabricates and sells high-quality cast polyurethane components for industry. For over 30 years we have focused on using speed and precision to manufacture the highest quality industrial polyurethane parts to our customers. A particular strength is the breadth of our in-house capabilities such as grinding urethane parts which, when combined with our extensive experience, enables us to deliver tight tolerance custom molded polyurethane parts while maintaining the quality control and cost effectiveness our customers require. Polyurethane gaskets are outstandingly able to withstand more loads than rubber because they are harder than rubber and yet more flexible than plastics. Their flexibility is accountable for their strength and remarkable ability to resist impact. Polyurethanes are the perfect choice for gasket applications against severe wear regardless of low temperature. For some decades now, they have been the most used materials for environments that are highly abrasive owing to their super ability to resist abrasion. No other form of elastomers, metals, and plastics has a better abrasion resistance than polyurethanes. Their abrasion resistance ability is rated to be 10 times better than what other materials can provide. Like their abrasion resistance ability, the properties of polyurethane materials are highly capable of resisting oil and chemicals. This enables them to maintain stability (with minimal swelling) in water or oil etc. If you are looking for elastomer materials to use in subsea, then Plan Tech’s custom gaskets should be your ideal choice. Productions such as prototypes as well as one time products or one-off parts are often manufactured using polyurethanes. Resilience is generally a product of hardness. Polyurethanes are the perfect choice for elastomer applications that can absorb shock. They have a high vibration frequency or outstanding ability for quick recovery. Their remarkable resilience ensures polyurethanes are very tough materials. In addition to these state of the art technical capabilities, Plan Tech also has an outstanding team of dedicated employees with exceptional talents designing and manufacturing urethane gaskets and all types of polyurethane molded parts. We also are very proud of the “company we keep.” Our customers include many Fortune 500 companies, most of whom have been customers for 20+ years. Their drive to become industry leaders has helped us do the same. Whether you are a start-up company or global leader, we can add value to your gaskets and custom polyurethane parts with our strong engineering support, polyurethane application expertise and constant focus on meeting all delivery requirements. The quality control department performs a daily inspection on all of our gaskets and custom molded urethane parts. The tests are performed according to an established set of standards and compliance certifications provided by an accredited testing organization such as the Society for Testing and Materials ASTM who define the procedures in detail. Our rapid prototyping capabilities have also received particularly positive feedback – we frequently go from “Print to Part” in 10-15 business days! Everything we manufacture is MADE IN THE USA! Please Contact us for further details regarding your specialty polyurethane gaskets!